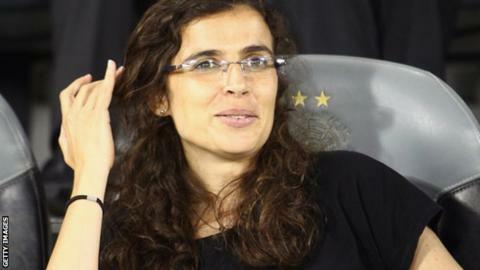 Portugal's Helena Costa is to be the highest-profile female manager of a European men's team after being named head coach of Clermont Foot in France. Costa, a former scout for Scottish Premiership side Celtic, has coached the Iran women's team since 2012. The 36-year-old, who has also coached Benfica's male youth teams and the Qatar women's side, will join Clermont at the end of the season. "It should help the club enter a new era," said the Ligue 2 club. Prior to Costa's appointment, the highest-profile female coach of a men's team in Europe was Carolina Morace, who took charge of Italian Serie C1 team Viterbese for two matches in 1999. Costa, who scouted for Celtic between 2008 and 2011, has also managed Portuguese lower-league men's team Cheleirense, where she won the Lisbon regional championship in 2006. Born in the Portuguese town of Alhandra on 15 April 1978, Costa has a Uefa A licence coaching qualification and a Masters degree in sports science. She helped Benfica's youth team to second place in their national championship in 2005 before going on to combine the role with spells in charge of Cheleirense men's team and the Sociedade Uniao 1 Dezembro and Odivelas women's sides. Costa left Benfica when she took over the Qatar women's team in 2010 and took charge of their Iranian counterparts side in 2012. She left Iran in September last year. A Celtic spokesperson said: "She did an excellent job for us and we know she will give her new position the same high level of commitment and dedication which she gave to Celtic." Najat Belkacem, France's Women's Minister, responded to the appointment by posting on Twitter: "Bravo Clermont Foot for understanding that giving a place to women is the future of professional football." Veronique Soulier, president of Clermont Foot's supporters' club, said: "It surprised us when we read the club statement. But once we got over it, we all believe that it is a good thing. "The boys in the team can be difficult to manage. They can be quite sensitive, that is what the other coaches have told us. With a woman in charge, maybe they will be less demanding." Costa spent 13 years as a youth coach with Benfica from 1997, in addition to winning two Portuguese national women's league titles with Sociedade Uniao 1 Dezembro in 2007 and 2008, leading the club into the Women's Champions League. She also guided Odivelas to promotion from the Portuguese women's second tier as champions in 2009. Costa led Qatar's women to their first international victory, a 4-1 win over Maldives in 2012, but was unsuccessful in her attempt to guide Iran to a debut appearance at the 2015 Women's World Cup finals. At Clermont, she will replace former Montpellier midfielder Regis Brouard, whose contract as head coach expires at the end of the season. The club are 14th in the French second-tier with two matches to play.